(Video) He Finds an Incredible Way to Charge His Car Battery. The Tool He Uses? My Mind is Blown! You can charge your car battery with a chainsaw- who knew? This is pretty crazy, yet cool! Check out the following video to see how it's done. Sometimes the most genius ideas come from moments of urgency and this cool trick is sure to inspire you to try useful hacks of your own. I would have never thought you could charge your car with a chainsaw, but sometimes the most bizarre methods will do the trick! Albert Howard check this$#%&[email protected]*out! You can wrap para cord around it and pull it several times to get a car started. He’s got a homesteading channel & FB page. I’m certain that you’d like some of his other stuff too. I’ve always thought that this was a good option (for a mechanical diesel). Really? Everyone should already know this. I’ll bet he was ecstatic with the way he dealt with that situation and probably ended up getting a charge out of it !!! Just weld a bit to the wheel.. keep a charged drill on you. The problem is an alternate must have power to is fields to work 9v or more constant on one and duty cycled on the other. No power no charging will happen. However if you have a generator this will work. Dumbest post ever. Who has a chainsaw in their trunk??? I cut fire wood off and on all year long. I don’t always carry a saw, but it would be handy to know when I do. I thought it was a must have, just in case of a zombie attack. I carry one in my truck at least all winter long. Never know when a tree might end up uprooted on my way home, id rather spend 20 minutes sawing on a log over backtracking an hour and then driving an hour down another highway to get home. 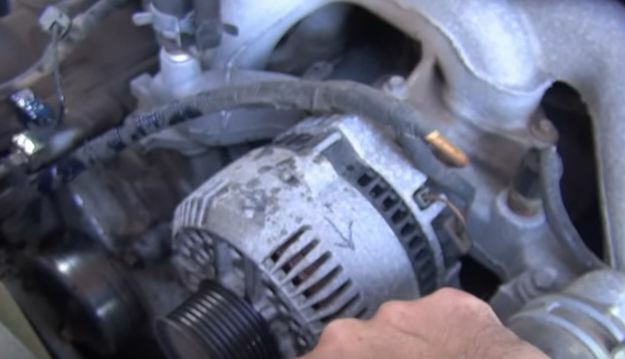 Amazing….. an alternator that is literally used to charge a battery in a car. Mind blown!!! Ok, but MOST people don’t carry one. More likely would have a booster pack anyway. And I always have a chainsaw with me! Really? This is a survivalist page but the opening line is “most of us opt to have our batteries changed by a professional.” If you cant change a battery you probably wont survive SHTF. why back to me…I don’t cut firewood anymore…..
Wranglerstar you’re even famouser now. 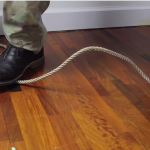 Genius… until you don’t have enough tension on the belt and it flies off in your face. Do we have the follow-up video on how to perform reconstructive surgery using parts from the chainsaw, various crap from the center console and glove box, and other ridiculous items that most people won’t have readily available in their vehicles?